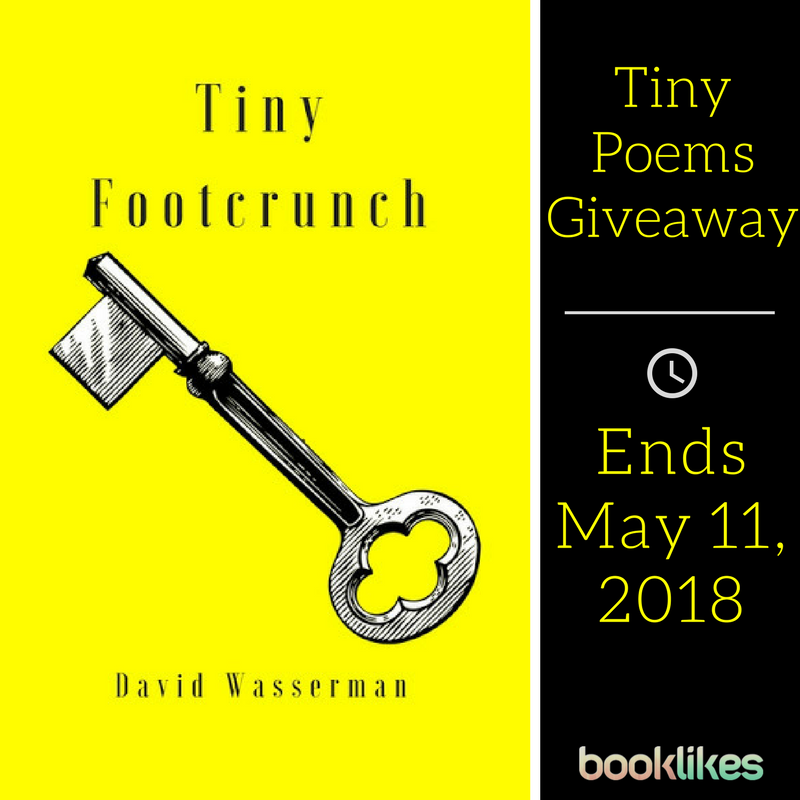 David Wasserman is the author of a book of poetry, Tiny Footcrunch. Read our BookLikes interview and get to know the author, who tells us about his debut, and how and why he writes! David has been very generous to BookLikes and offered five copies of his book to our readers - enter our giveaway contest to win! Tiny Footcrunch was born out of emotions and sharpened by society’s waning attention span. It delivers vast thoughts through tiny poems. Ten universal emotions. Sadness. Joy. Anger. Kindness. Fear. Love. Confusion. Humor. Curiosity. Hope. Ten petite poems carefully crafted and shepherded into each bloodline. This collection speaks to the era of texting tweeting twittering fast-paced visually digestible media we live in every day. Literature has changed. Long-form storytelling through print is falling out of favor while comments, posts and captions increasingly become the new narrative. These tiny poems bridge that divide. Hi! I am David Wasserman from Connecticut. I live in a quiet spot out in the woods with my wife Katie and newborn daughter, Lettie. In college I majored in both Elementary Education and English Literature. I started teaching (fifth and second grade!) but a decade later began to miss that connection with literature. Why did you choose to write poetry? Is this a choice an author makes, or does it "make itself"? In bed one night I reached over to my nightstand. My hand hovered over a stack of three books but floated instead over to my phone, where my nightly reading became 140 characters at a time (on Twitter), picture books (on Instagram), and poorly-written biographies (on Facebook). 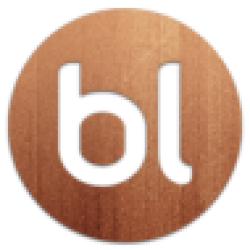 I eventually became disgusted with myself for choosing these apps over literature, and much like someone might look in the mirror and emphatically decide they need to go to the gym, I decided to write. I guess you could say poetry and I chose each other, as it was the perfect medium to bridge that divide between short tweets and texts with novels. When did you start writing? Your first book of poetry is out in a few days, did it take a long time to write? I started writing some of the poems contained in Tiny Footcrunch in the summer of 2016, so it ended up taking a little over a year to finish. I began with simple thoughts, ideas and lines scribbled in a notebook while I sat on my front porch, and eventually edited those into something close to a manuscript. While the poems are obviously up to the interpretation of the reader, some events from that time period are evident, such as the passing of my grandfather, the loss of a cat, the political climate, and the upcoming birth of my daughter. Even though the poems are petite and haiku-length, they took a long time to write! Every word becomes that much more important. What are the emotions associated with a book launch when it's your first title, a debut? Mostly excitement. Nervous thoughts about what family and friends might think about the book have crept in as the release gets closer, as well. Something I did not really expect to feel as much as I do is a swelling of pride and confidence. I am very proud of these tiny poems and so flattered that someone thought enough of them that they wanted to publish the book! What are your future writing plans? Do you actually have any at this point, or will you start thinking about that after you release your first title? I do have future writing plans! 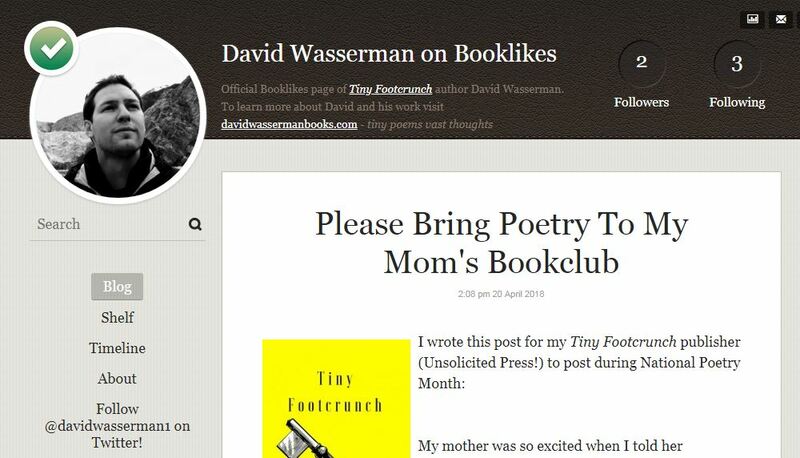 I was so excited that a publisher liked my poems and began thinking of other ideas not long after we started the editing process on Tiny Footcrunch. Right now I am working on a poetry manuscript inspired by Tarot cards. So far the poems are even more direct and terse than those in Tiny Footcrunch and I am really starting to see how it will take shape. I would love for this book to contain small illustrations as well. Please tell us about your day and your writing habits. Do you write every day, and for how long? Do poems take more or less time than other literary forms? I don't write every day. Is that horrible to say? Stephen King in On Writing has a section about how some authors write an enormous amount while others are lucky to get one word down on the page and I have to say that I am both those writers. Some days I will get five or six poems down and edited to where I like them. Other days I will just turn a phrase around in my head for hours, playing with words like seals with a beach ball. I'm lucky if I get anything jotted down even in the notes on my phone as I am falling asleep on days like that. You live in a very quiet spot, in the woods - do you find this setting to be an inspiration? I would suggest that my home in the woods is the biggest inspiration to my work. Everything from my cat sticking his head between the porch spindles to the wind chimes to the robin hopping around in the yard is fair game for poetry. The same is true for you wherever you live - look around with a poetic eye, turn on your other senses and the poetry of your environment will open itself up to you as well.